The JASON CD Transport is an addition to our already famous MEDEA D/A Converter. The design and electronics are of the same high quality in both units. 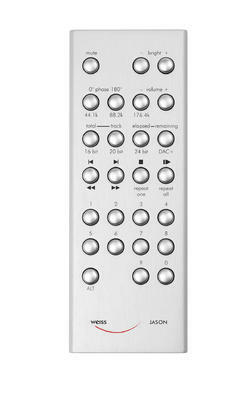 We included many features in the JASON which make it the CD Transport of choice not only in conjunction with the MEDEA but for all kinds of D/A Converters or Digital Amplifiers. The JASON uses a high-quality top-loader transport system. 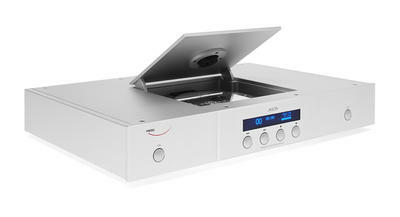 A heavy-duty motor driven lid protects the CD and also safely puts the puck onto the CD upon closure. The chassis is of the same quality as the Medea chassis, a dual design with a inner chassis made of steel and an aluminium outer chassis. The feet are resonance absorbing types of our own design. The JASON contains an upsampler feature which allows to upsample the basic 44.1kHz / 16Bit data stream from the CD to 88.2 kHz or 176.4 kHz for subsequent D/A conversion. For the upsampling we use our proven algorithms used by many of our professional studio customers. The upsampling process has the effect of generating a wordlength longer than 16 Bits, in the JASON a 40 Bit Floating Point format is generated. In order to output the upsampled signal, it is reduced in its wordlength to fit the standard AES/EBU or S/PDIF formats. This wordlength reduction uses the POW-R # 3 algorithm, which is one of the best wordlength reduction schemes, widely used in Pro Audio equipment. The output wordlength can be selected between 16, 20 and 24 Bits, which allows to hook up a wide variety of D/A converters to the JASON. The JASON uses a specific method (spread spectrum technology) to treat the output signal such that the clocking quality of the subsequent D/A Converter does not have much influence on the audio quality. This allows for the use D/A Converters with non-ideal clocking performance.